We get asked by doctors very often, practically everyday, about how they can move from their current EMR system to SeriousMD. I thought I’ve already heard of all the systems out there. Apparently, not all, because I was actually shocked to hear when I heard about a doctor in Bacolod and 1 doctor in Makati using Trello (premium) as their EMR. 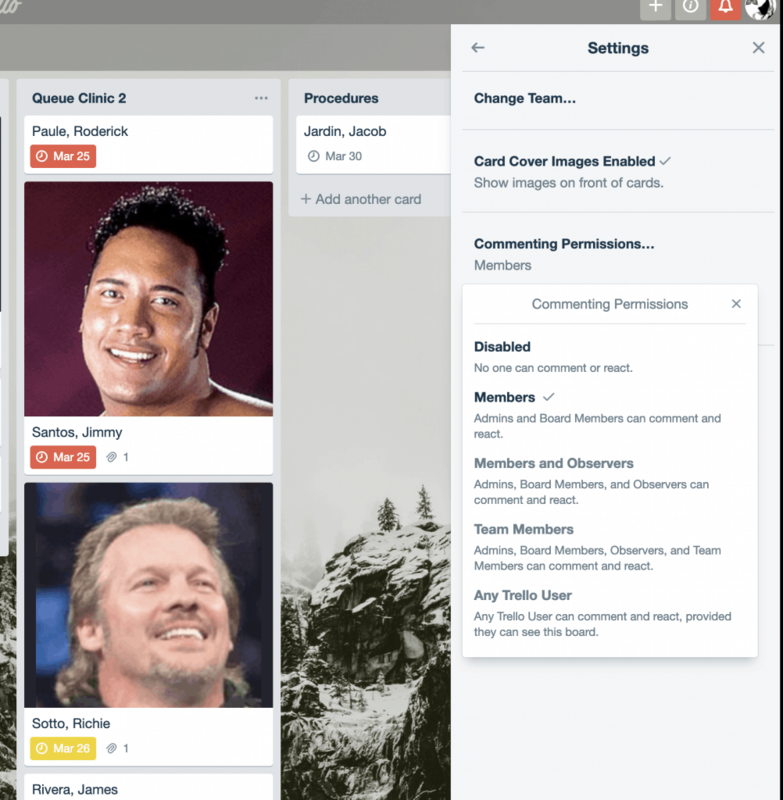 I personally use Trello everyday and we also use it for sprints here at SeriousMD. We’ve never even imagined Trello being used for medical records at all. You might be wondering why I’m even bothering to make a blog post about it and promoting a possible competitor. You see, we have no problems with competitors. People have the right to choose and doctors that are using competing system probably saw them before they saw SeriousMD or maybe even before we existed. We are perfectly comfortable with what we are doing, with our technology, with what we are offering and we are surely confident with our service. With that out of the day, I wanted to give Trello a try as an EMR to actually see the positives and flaws. Hopefully, by the end, it can help somebody out there to make a better decision for his or her medical practice. 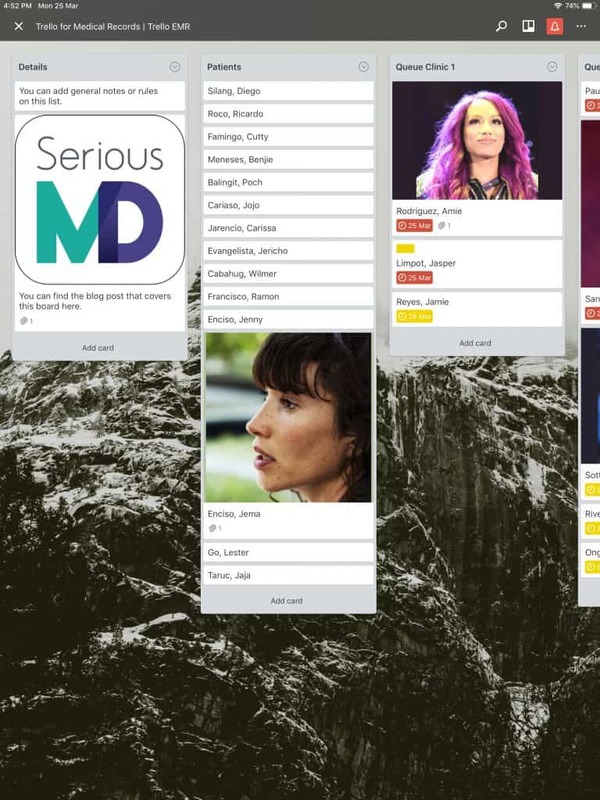 Of course, there will be multiple ways, perhaps doctors using Trello now as their EMR might consider something simpler. For me, I’ll integrate a queue list, a patient list and a procedure list as well as the calendar power-up. 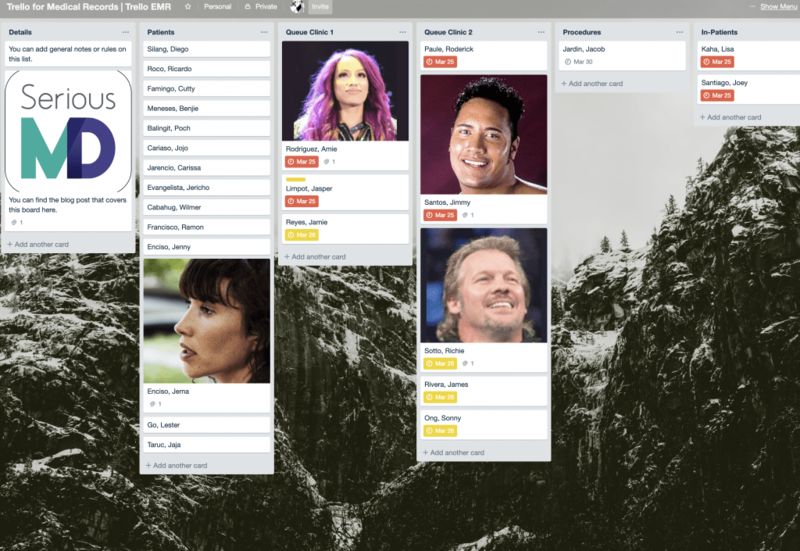 I will also use Labels and a Chrome extension to really maximize the whole Trello experience. The make believe doctor (me in this case) will have 2 clinics & 1 secretary. Here’s my finished product. You can actually copy it if you find it useful. The board is separated to a few lists. I will keep the workflow as simple as possible. You have a list for all patients. 1 card = 1 patient. This includes all patient details + pictures. If there are labs, just dump it all in there. Billing is tracked within each card per patient. There’s a queue for each clinic. My imaginary secretary moves the patients to the queue, assigns the date and can reorder the queue as needed. Labels can be used to track certain things like HMO’s. Due date is used to note scheduled procedures or when the patient’s appointment is. For the in-patient list, I used due date to keep track of admission date. At the end of the day, the patients in the queue are moved back to the patient list. Same with discharged patients. For this experiment, I brought this to 5 doctors and we tried it for a few times to identify the common pros and cons. I will break it down to 4 sub-categories below so I can fairly judge using Trello as an EMR system and a practice management software as well. One of the things I imagined before getting started with this was how I’ll be able to keep patient records. Well, if you’ve used Evernote before, you basically keep adding new notes, this time, you put it in the Comments box. Click Attachment if you want to attach files and media. Add non-medical related information in the Description area and label the card as needed. It works. It can store patient data though it’s not structured, which means it’s useless for reporting. Queueing is simple at the start. You just move the patient card to the correct queue but it will be a mess eventually because you or your staff will have issues moving card back and forth. You’ll eventually stop adding dates, too because it’s so tedious. It’s super easy to invite. Permissions are pretty easy to control but it’s lacking. 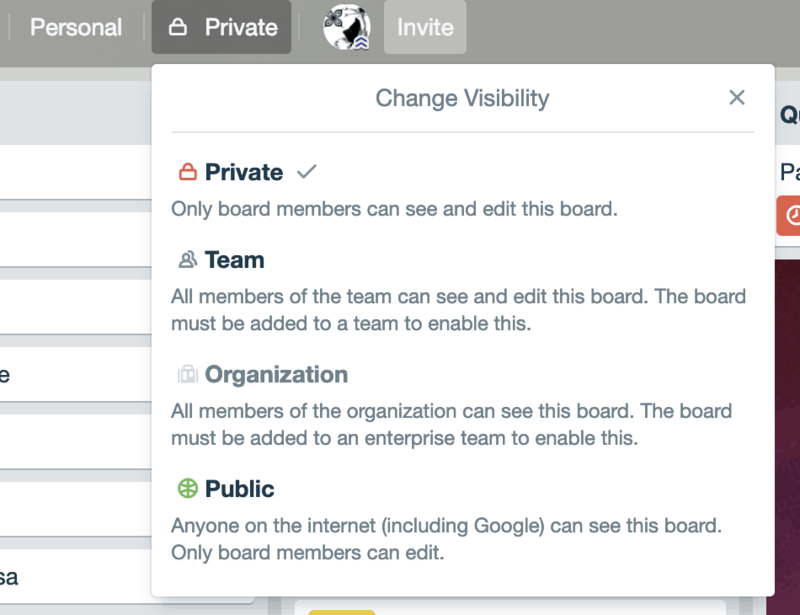 Basically, your team/staff can either add, edit or not but they have full access to the data on the board. The Trello app was recently updated to allow offline data access. I’m not sure how much data it saves offline though if I have other active boards that have a lot of data so I’ll have to test that further. I can definitely access it offline when moving around on the iPhone and access it on the iPad. Just make sure it syncs so you’d have your data with you when going around. Offline use for the app is now available. Remember to sync. You would prefer to see everything in 1 board. The power ups can’t be used in the app at the moment. Labels can be hard to track. 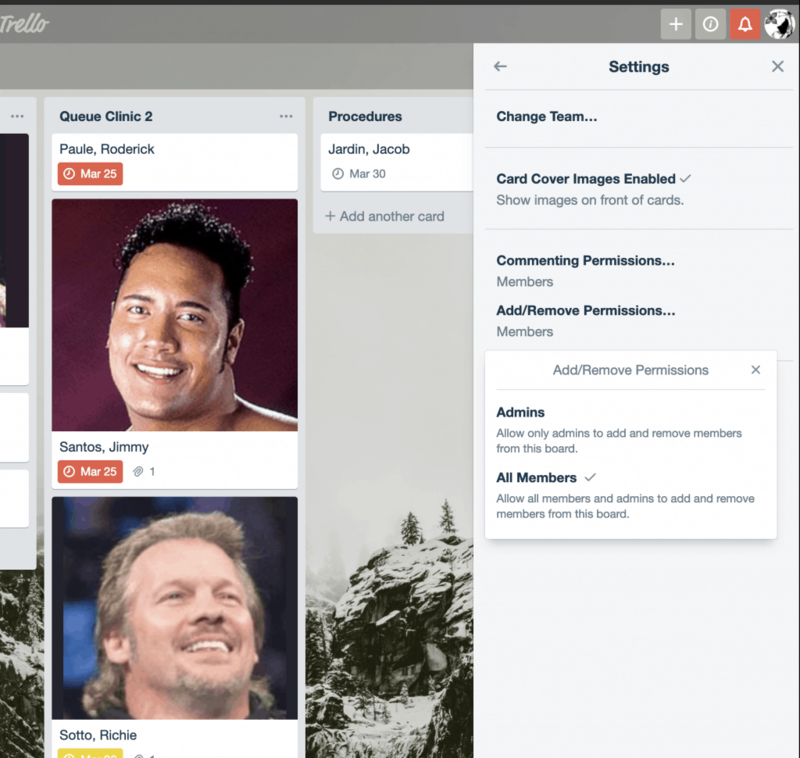 You’ll need a Trello Chrome extension to properly show you what you labels mean. You’ll have to keep a template card on the board at all times. Data is not structured, so you cannot ever run reports. No printing. You’ll basically be writing your prescriptions etc. Virtually no support for your needs because it’s not really made for medical use. Slows down as more cards are added to the board. You’ll start to feel the slow down when you hit around 500 active cards on older devices. Workflow looks like it will be a lot more work for the staff and for the doctor. I outlined 1 workflow here but I thought and tried other workflows and they didn’t perform any better. Tracking HMO’s well, you can use labels but I’m pretty sure you won’t remember which label is which. Permissions are lacking, pretty sure this won’t pass the DPA if it was really strict. Very easy to publicly share a board, which enables your whole patient database to be accessible. (Accidents can happen. I remember we had a delete button in our app, the app asks 3-4 times to confirm the delete and accidental deletions still happened. So, we removed the function completely!) See for yourself in the image below, it takes 1 click. If you want to use it for your personal use just simply to add notes and you don’t really care about the future implications, then you definitely can use this. It’s actually better than some of the EMR’s out there right now. At the end of the day, it boils down to one thing. Can you survive with just Trello to be your EMR or practice management app? Though I love Trello, it isn’t really built for medical use nor is it built for the regular clinic workflow. You won’t have the databases you need for ICD, nor for medicines, you can’t print, you can’t really do much besides keeping a picture of the patient and keeping pictures of lab results, which will be all jumbled together inside a card. You’ll end up using other apps in tandem and saving the file in the card or attaching a link like a Google Sheet link. Just imagine this: 1 of your patients probably has a folder full of notes and lab results. Now, how can you put those inside a single Trello card and manage to find what you need? Just that alone should be enough to let you know how this will work out for you. I’ve also seen doctors use other softwares that are built for Spas, basically handling the appointments of “facilities” – then the software just had a text box for notes. Much like Trello, those kinds of software really shouldn’t be used for medical notes nor should you expect anything more. There are “workarounds” for software workflows… you can make some parts of an app work with what you need, but there are workarounds to just be stubborn. It’s not efficient at all when you admit it to yourself. In the future, standards for healthcare data will be implemented and since you are keeping unstructured data in these boxes, you’ll end up with wasted time, wasted effort and of course, there’s a good chance that you won’t be able to use the data you’ve inputted in such software at all. In short, let’s just say that it isn’t future-proof. My final verdict, is a clear no. I cannot recommend it to any doctors that want to use it as an EMR or a practice management app. Use it instead for what it was built for, to track other projects, tracking department tasks or handling daily to-do lists. Are you using Trello to keep your medical records now? If you’re ready to actually take the leap and change to a real EMR/EHR system (ahem, SeriousMD) – contact us and we’ll help you out. Here’s how to easily export your patient data from Trello. We don’t recommend the official Trello export as it’s not a complete export.